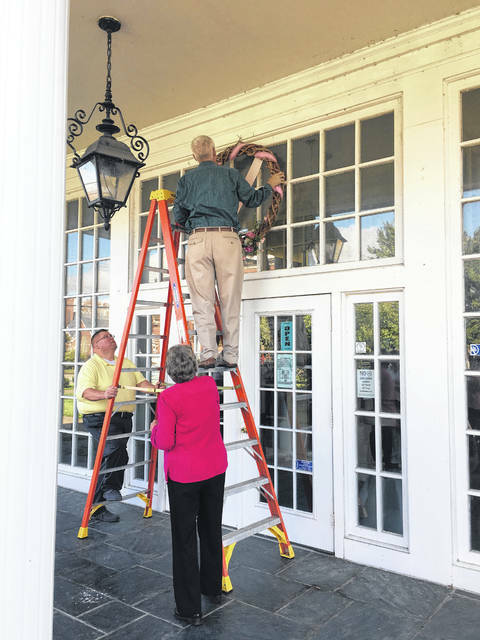 Commissioner Rick Handley had the honor of hanging the Breast Cancer Awareness wreath above the Mason County Library’s entrance way. Mason County CEOS President Clinedda Austin giving her welcome at the wreath hanging ceremony. Missy Thomas was elected to be the first one to light a candle. While eating their lunch those in attendance talked among themselves, sharing stories of how cancer diagnosis’ of people they know/ have known impacted their lives. 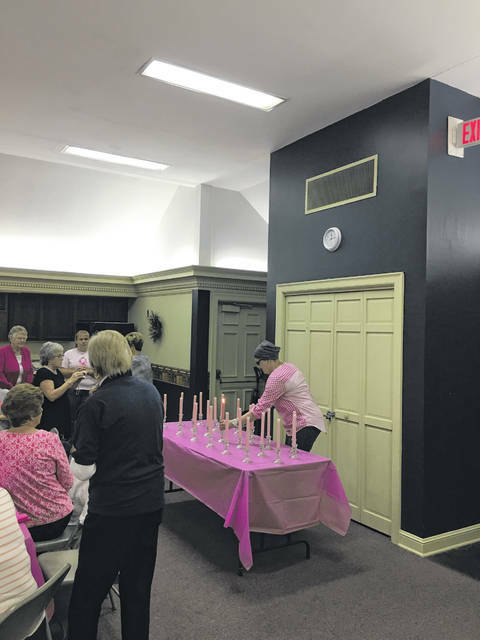 Each guest in attendance of the ceremony and luncheon was welcome to light a candle in honor of a breast cancer (as well as other cancers) survivors, in support of those still fighting, and remembering those who have lost their battle with the disease. 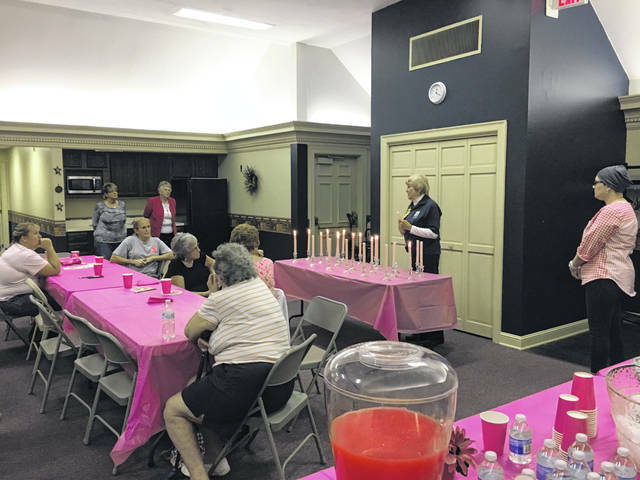 POINT PLEASANT — To kick off Breast Cancer Awareness month, the Mason County CEOS members hosted a wreath hanging ceremony and luncheon on Friday in honor of breast cancer survivors, in support of those still fighting this disease, and in remembrance of those who have lost their battle with this disease. Austin explained breast cancer is the leading cause of cancer related deaths in West Virginia women. She commented October is national Breast Cancer Awareness month and the goal is to raise awareness and spread the word about the importance of early detection. 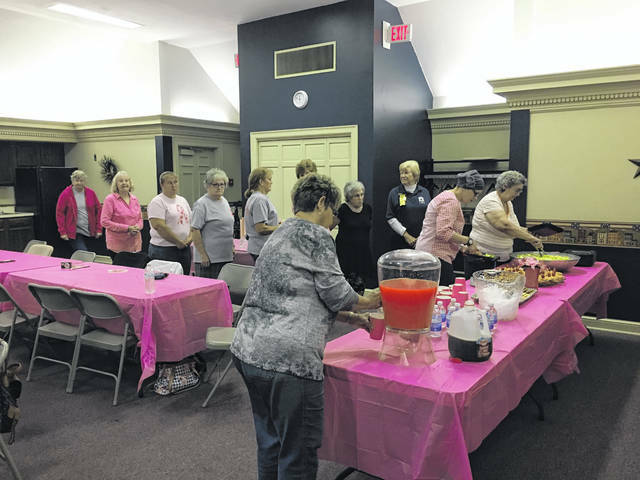 Austin shared the Mason County CEOS members will be holding its annual Breast Cancer Walk on Saturday, Oct. 20. The walk will be held at Krodel Park with registration beginning at 10 a.m., followed by the walk at 11 a.m. Donations from the walk will benefit the West Virginia Breast and Cervical Cancer Diagnostic Treatment (D&T) Fund which is a fund that offers free and low cost mammograms and pap tests for women who may not otherwise be able to afford the screenings. 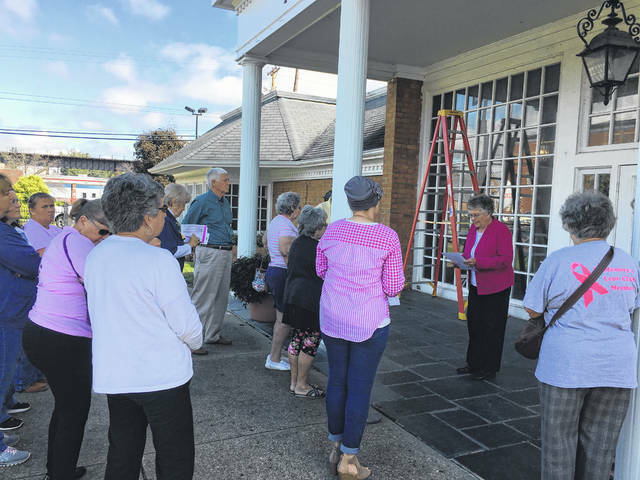 Commissioner Rick Handley had the honor of hanging the Breast Cancer Awareness wreath above the Mason County Library’s entrance way and Pastor Bob Patterson of the First Church of God gave the invocation. Following the wreath hanging, a luncheon was held and those in attendance were able to hear from a special guest speaker, a breast cancer survivor, Missy Thomas of Leon. Thomas shared she was diagnosed in stage one of her breast cancer in January. She explained the treatment regimen for those diagnosed with triple negative breast cancer and discussed her treatment throughout this past year. Thomas shared recurrence can happen sooner in triple negative breast cancer within the first five years and can spread to other parts of the body. She commented when she makes it to the five mark, she will be considered cancer free. “If you are a woman that is on this journey, or maybe your journey is just beginning, I want to encourage you to dig down deep and find the courage to continue to stand strong and fight, to keep your faith because God has a plan for you, and to remember you are not alone in this battle,” said Thomas. Lunch was served after Thomas shared her story and those in attendance talked among themselves, sharing stories of how cancer diagnosis’ of people they know/ have known impacted their lives. To conclude the luncheon, each guest in attendance was welcome to light a candle in honor of a breast cancer (or a different cancer) survivors, in support of those still fighting the disease, and remembering those who have lost their battle with the disease.